Having been a photographer for 48 years, I’ve experienced all kinds of flaws, defects and other apparitions on my negatives and now digital images. Most have been identified or at the least, understood to be some kind of image pollution ranging from light leaks, lens flares, dust, fog or other type of atmospheric condition. Since the advent of digital imaging however, there is a new phenomenon called “orbs” that are appearing in increasing numbers on many photographer’s images today. I’ve always been quick to point out to those who asked that it’s probably one of the artifacts I mentioned above. This always leads to a spirited debate about whether these orbs were indeed proof of spirits or not. It was a subject that I thought non-photographers really knew nothing about so my explanation to them was always the same. “You see there is an effect in photography called the circle of confusion. It has to do with depth of field and where an object is in relation to where the lens is focused.” At this point I usually see a big circle of confusion on the person’s face as I continue trying to explain this property of physics. “It could have been an insect or something else moving in front of the camera,” I would quickly respond, leading our discussion into a spirited debate that always ended in a standoff over what exactly the picture had captured. The scenario I just described will now change forever with the story I’m about to tell you today. As with all things in my life, it begins with the synchronicity of a connection to my book The Key of Life. On May 18, 2012 I received a request on LinkedIn from a person by the name of David Banagis. I didn’t recognize the name but saw he was friends with another friend of mine on the East Coast named Charlie Rasak so I clicked accept on the link. Within a few hours I received an e-mail from David reminding me that he had contacted me two years earlier after reading my book which Charlie had recommend to him. David had recently lost his wife Beverly and was searching for answers to synchronicities he believed were directly connected to Beverly reaching out to him from beyond. When David called me early in the summer of 2010 I was in Pennsylvania taking care of my mother. She had recently had a heart attack and in the process of trying to recover discovered cancer was also at work on her body. We moved mom into hospice in August and she passed over on September 17th. I had told David I would have to call him when I returned to California but with all the things occupying my life at the time, my promise to return his call was forgotten by the time I got back home. Now here he was trying to reconnect with me to discuss The Key of Life and share his stories as well. Everything along the timeline happens when it’s supposed to and this story is a prime example of that in several ways. At 9:33 a.m. on Saturday May 19th I finally made good on my promise and called David Banagis. He was excited to hear from me and after our initial pleasantries, began relating the synchronicities he had been experiencing in his own life. David’s wife Beverly had passed away on May 21st. 2008. The two of them had been like “twin flames” he said and her leaving him was almost more than he could handle. Five days after she passed David was sitting with a group of relatives and friends in the backyard when a wild rabbit hopped up into the center of their circle. After discussing the rabbit it turned out that many of Beverly’s relatives and friends had either received or would soon receive, up close and personal visits from “bunnies” over the next few days. What happened next was an even more direct connection for David. David’s granddaughter was sure she could sense Beverly’s presence near them in the house so one day she took her camera out and decided to try to coax her grandmother into making her presence known through a photograph. “Nanna if you’re here I’m going to take some pictures. Please let me see you,” she pleaded. She then shot an image of her grandparents bedroom. “I’d love to see these photographs,” I replied. To my surprise he immediately agreed to send them over to me. I decided to keep any comments about orbs and circles of confusion to myself until I could see these images. I could, however, begin to hear my own mother’s thoughts coming into my head as David continued talking about the orbs. “Didn’t you see the pictures you took of me and Dad?” she said. “What pictures of you and Dad?” I replied. 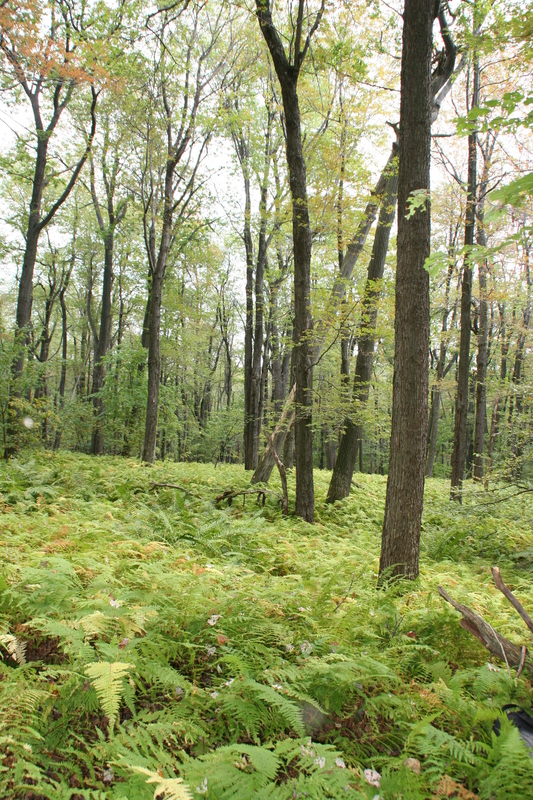 “The pictures of us in the forest,” she answered. I finally realized she was talking about the day my brothers and I took our parents ashes into the Pennsylvania woods to scatter them in the mountains they used to hike. I had my camera with me to take pictures to send to our sisters who couldn’t be there. Both I and my brother Tom had taken quite a few shots of the area that day. I made a mental note to take a new look at the images when I got back to my computer. It wasn’t but a few hours later that I received an e-mail from David Banagis with the two orb photographs attached. I took a quick look at them on my cell phone but decided to look at them more closely on the computer later. On Tuesday May 22nd. I finally had a chance to examine the images in detail. 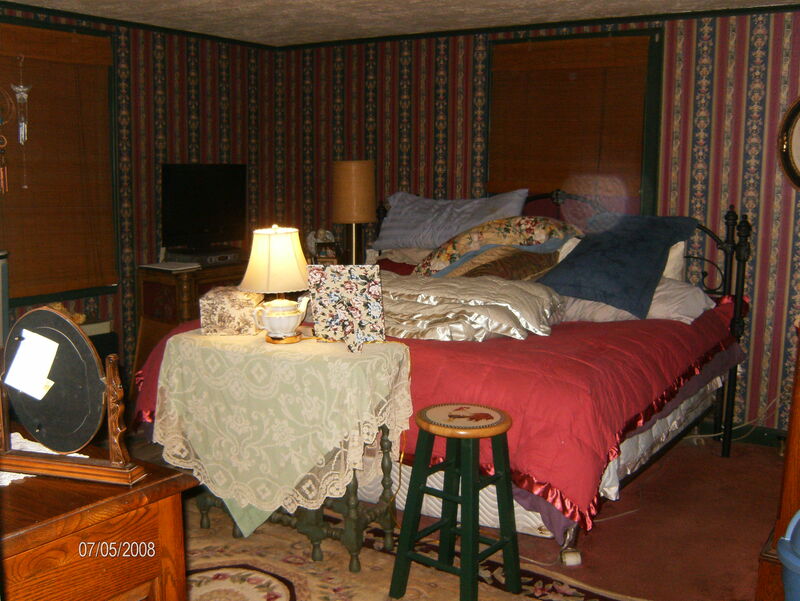 The first photo clearly depicted an orb hovering over the blue pillow on the right side of the bed. Exactly where David said his wife use to sleep. If you look very closely you can also see two smaller orbs in the window shade just below the valance. 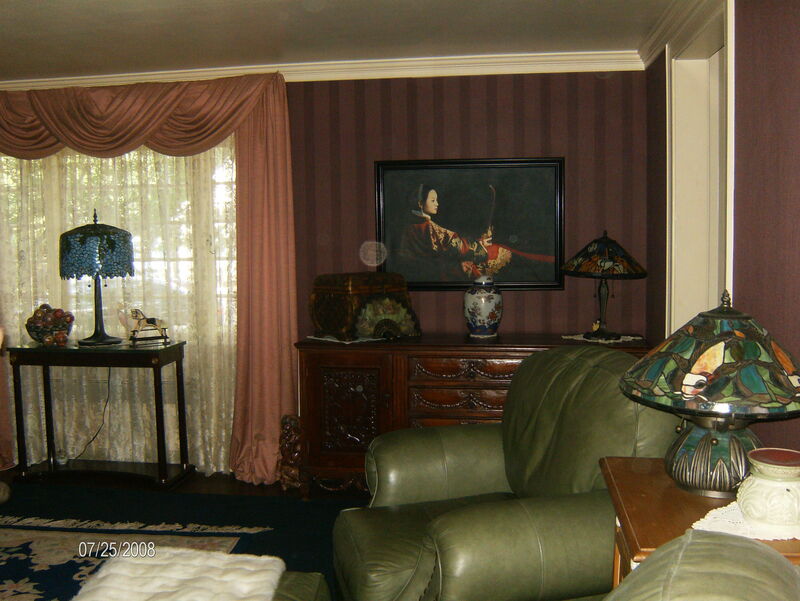 The second photograph revealed an orb floating directly above the urn containing Beverly Banagis ashes. Upon closer examination I could also see the smaller orbs again. One immediately to the left just before the curtain and to the right in the photograph just above and to the right of the vase. 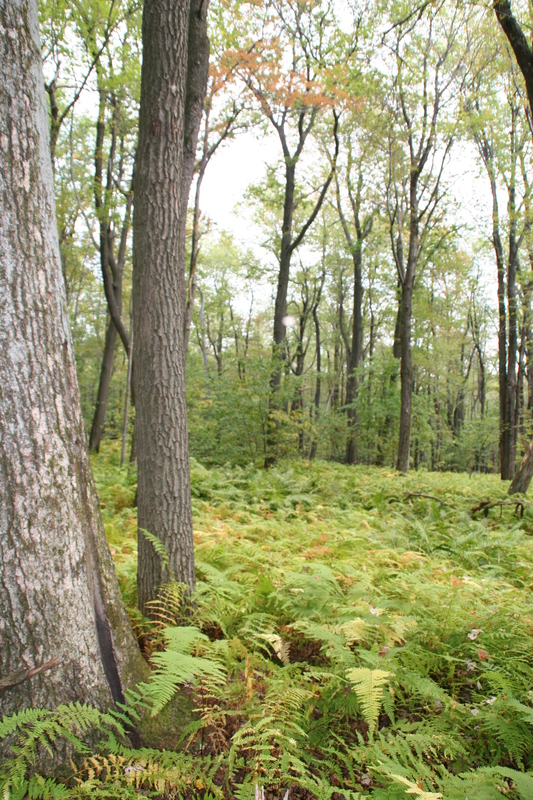 As I examined the two photographs, I could again hear my mother’s thoughts wafting through my head, begging me to look for the images from Pennsylvania. I directed the cursor over to the My Documents folder and opened up My Pictures folder to begin searching for the file I had placed them in. It wasn’t long before I located the folder titled Mom and Dad funeral. I laughed at what I had titled the file back then. Thinking about it now I realized it really wasn’t so much of a funeral as a stroll in the woods. At the time, however, I thought it would be the easiest way to find it again. I quickly opened the images into a filmstrip view and began scrolling through the photographs. When I got to image number 8974 I stopped. This was one in a series of individual vertical format frames my brother Tom had grabbed wanting to create a panoramic shot of the area where we had scatter our parents’ ashes. It was important because this frame was centered exactly on the spot where we had placed our parents remains. As I clicked on the image to bring it to full view my jaw dropped. There in the center of the photograph, right above the area where our parents lay were two beautiful spheres of light. 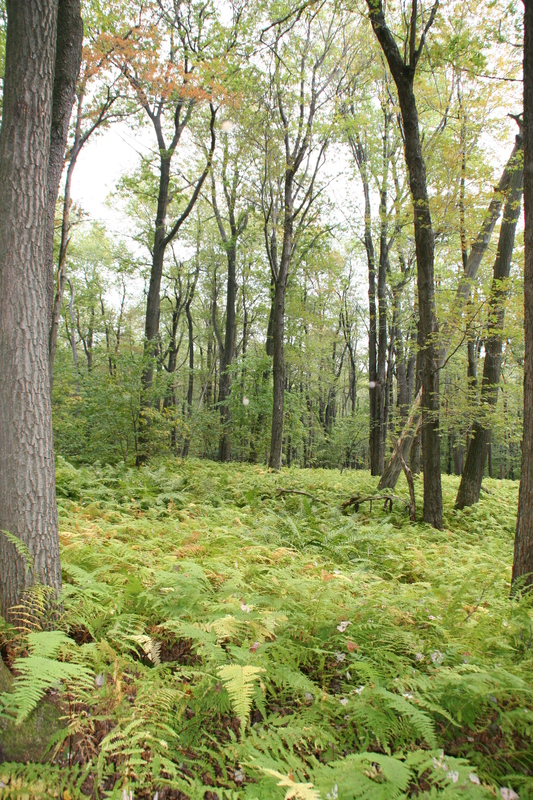 They were floating in this peacefully tranquil setting about five or six feet apart and eight to ten feet above the forest floor. This is the original full frame image of the two orbs floating over the spot where we scattered our parents ashes. As I zoomed into the photograph, the majesty of that moment in time engulfed me. Here were two souls, drifting through the forest, revealing themselves to the camera in their truest form. Two balls of light! How could I have missed this before? It was more than apparent now. I quickly looked at frame 8973 taken immediately before and framed to the left of this one. Captured in that frame is the orb from the left side of the center photograph. Exactly where it should be as it was entering the area. Here is the orb that appears on the left in the original photo. It’s captured in the previous frame as it entered the area. A quick look at the third frame 8975 also revealed the orb that had been seen on the right side in the main shot. Here is frame 8975 capturing the orb that appeared on the right in the main image. Outstanding! Having more than one image taken in this way was very important for several reasons. By capturing the objects in multiple photographs it gives credence to the fact that these balls of light are real objects moving and occupying a specific point in space directly in front of the camera. They could not be lens flares because it was an overcast day and there was no hard points of light to flare off the lens. The orbs were also not a problem created by depth of field and focus. The photos were taken with an 18mm lens and everything is in sharp focus. It also wasn’t something on the lens either as the two orbs don’t appear together in any other photos and the single orbs are in different positions in the previous and post images as well. Also none of the other photographs taken that day shows any sign of abnormalities where the orbs appeared in those three frames. The orbs seem to have a clearly defined three dimensional quality too them. As you blow up the images you can see that the light seems to be radiating and swirling much like the sun or some other kind of fluid energy. The data on the camera shows that the ISO speed rating was 400, the shutter was 1/250 and the aperture at f5. The flash did fire on the camera in all three photographs. These orbs are not birds or insects or any type of solid creature with a body. You can actually see through them somewhat. If they were any type of bug or flying animal the camera’s shutter speed would have captured the solid definition of a body. 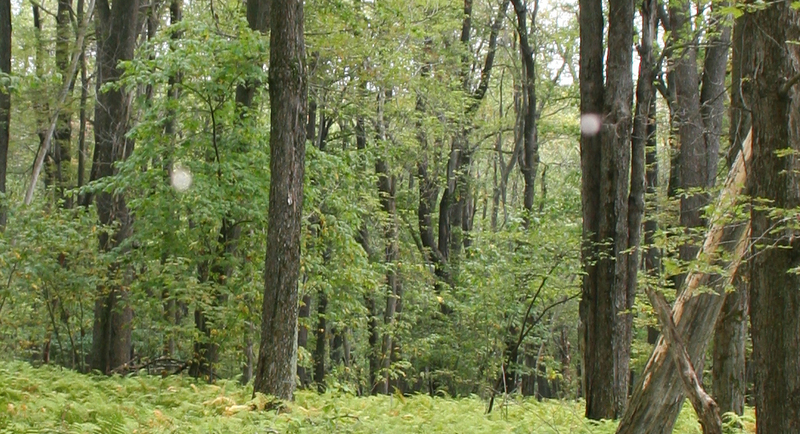 Here is an enlargement of frame 8974 with the two spirits floating in the forest. 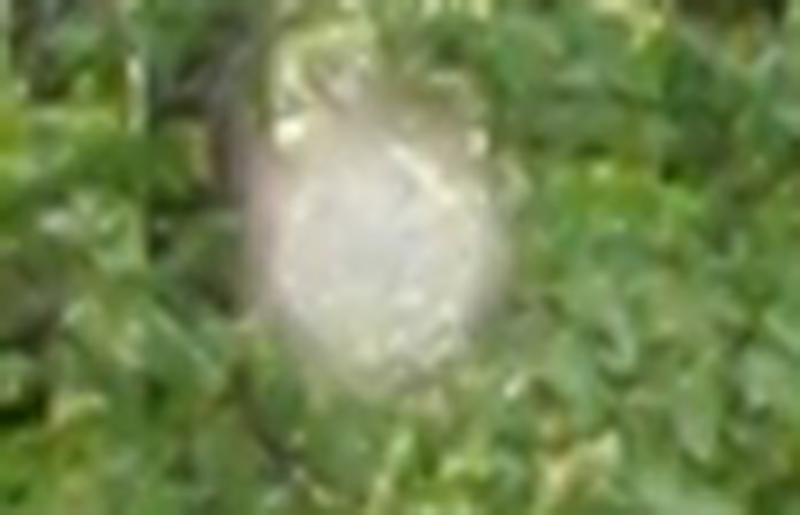 This is an extreme enlargement of the spirit orb seen on the left in the original photograph. Notice how the light or energy seems to be circling around the sphere. I had mentioned earlier that everything happens on this timeline when it’s supposed to happen. If I’d have called David two years ago to talk with him his stories and photos would have carried no weight for me. My mom was yet to pass on and the day spent in the forest was yet to come. The best story I can tell you though is how we came to scatter their ashes on the day that we did. My mom passed on Friday, September 17, 2010. We had a memorial luncheon for her friends and family the following Monday September 20th. We were assured by the mortuary that her remains would be ready for pickup on Tuesday morning September 21st. but when I called the next day to check on a time for pickup they informed me that there had been a holdup with the paperwork from the coroner so they hadn’t cremated her yet. We couldn’t get the ashes until the following day, Wednesday Sept. 22nd. I was upset at first because the weather was sunny and beautiful both Monday and Tuesday but rain was forecast for the 22nd. Also my brother Jeff was trying to get out of town as soon as he possible and this would delay him another day. I sat in my car wondering why this delay was being pressed upon us when I heard my mother’s voice come floating into my thoughts. “Why do you think we want to have you scatter us on Wednesday?” Her thoughts were asking me to look for an answer I already had. Wednesday was Sept. 22nd. My mom and dad’s anniversary. Of course why else would they want it delayed until that day. Everything happens when it’s supposed to and the universe will conspire to make sure it does. There is no more beautiful tale than that of two souls, reunited again and making their appearance known to the other souls that have shared their life story. These photos and the story that goes with it will remain in my heart forever. I want to thank David Banagis for feeling the spirit move him to reach out and contact me again. I’m sure there are many more stories to come as we make our way along this timeline. For further information on Orbs. Miceal Ledwith, Ph.D. & Klaus Heinemann, Ph.D. are two scientists who wrote a book called The Orb Project. It takes an in depth look at the phenomenon and reveals quite a bit. If you’re seriously interested in the subject and would like to learn more, I would suggest reading their research. This entry was posted in Orbs and tagged Orbs, souls, spirits. Bookmark the permalink. It is a very interesting subject. I havent gotten The Orb Project book yet but am very anxious to read it. Every thing I’ve read on the subject points to direct communication with the spirits in order to get them to appear on the image. I’m wanting to go out and do some of my own experiments to see if I can capture them. Are you up for a photo shoot sometime? It would be a blast. Jim, I just spotted one below the urn of ashes as well. It’s very colorful and stands out against the dark scroll work in the furniture. There is also one in the green chair along the edge of the seat cushion near the front of the chair. I’ve been looking through my other pictures too and discovered them around Kyle during his birthday party last year. What I’m really noticing is finding them in other peoples pictures on Facebook, especially family shots. Send them to me in an e-mail so I can see them. Hi Randy; I saw your post on Erin’s FB page. I sent her a photo I took at Chartres Cathedral in 2010 filled with orbs. First time I ever used the camera. I thought I had purchased a defective camera! I have to call Erin and get her to send me an original file of the pic. Not sure exactly what it is because according to the person who shot it there was a plate with corn on it just below the camera. It may just be steam from that plate but I’m still investigating. It is an incredible picture. Send me you Chartres Cathedral shot. I’m sure it’s incredible. I really enjoyed this blog post Randy …I now want to start reviewing my own enormous library of photos! I just finished ready the Key Of Life and am ready to delve into what I know is a big part of my mission in life…To teach,inspire,learn and most importantly love….Thanks for the awesome work that you are doing… I am so glad to have you and your work as a mentor in my amazing journey! It was a pleasure meeting you the Ganesha Center in Las Vegas. The video that you took while we were hypnotized was amazing! I’ve kept an open mind to spiritual things and had heard about orbs from Edwige Bingue on a previous visit to the Ganesha Center and found it fascinating. But when I actually saw the orbs on the playback of the video, it was truly inspiring. As a semi-professional photographer, I’ll be taking every opportunity possible to capture orbs in my photos, if they’ll let me. Thanks for taking your time to sharing and showing our “Key of Life”. I totally believe in the afterlife and know my dear father, who I lost at age 16, has always been by my side, everyday and always, still!!!. Even though I have not experienced capturing orbs of my dad on photo, nor have ever taken precious time out of such a short life, to do so, it’s not because I don’t believe, it’s because I’ve got one of a different shape, it’s the brightest star in the sky, of which I can see with my own eyes, every night of the week, even on cloudy nights, thats my orb ( my dad) and the coincidence of it all, is that it’s in orbit. My question is, are the orbs seen by the human eye, or only captured by photography??? when I look at the orb or orbs, located in Davids bedroom, I first need to know, if thats a sun catcher to the upper left side of the photo? If so, then those orbs could easily be just a refection in the cameras flash? Please don’t misunderstand me, I’m a believer all the way, just need to know. Some orbs are seen by the human eye but most of them are captured only by the camera in the near infrared range of the light spectrum. In response to your other question about what you call the “sun catcher,” I do believe that it is a dream catcher you see in the photograph but it would not create a reflection of any type as they are usually made of non-reflective materials and the orb in that photo is over on the opposite side of the image no where near where a reflection would appear if it came from that direction. Reflections or lens flares usually trail down from the source towards the center of the lens and are usually very easy to identify. Again, not all “orbs” are orbs but I do believe these two images contain actual obs in them. Thanks for sharing that story about your parents . They were always close glad to see they found each other again forever ! The more I read your stories the more I notice my own experiences . Hi! What a beautiful article! I was wondering if I could get your expertise on a photo that I believe has two orbs overlapping and one of which has a hummingbird shape in it. Or…perhaps it’s some kind of light phenomenon…. But I’ve been doing a lot of spiritual work lately and I’m trying to have a realistic outlook on this recent experience. Just came across your request which was somehow not posted. If you want me to look at the pics I can just send me a personal e-mail through my contact info with the pics attached.